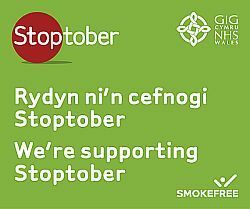 Stoptober is the 28-day national stop smoking challenge, now running in Wales. Research has shown that people who manage to stop smoking for 28 days are five times more likely to stop for good and last year in England, thousands of people successfully quit in the biggest mass participation stop smoking challenge ever. Stoptober is an online based campaign and registration is only available via the Stoptober website. While Stoptober is a national campaign aimed at smokers, there’s nothing preventing you from quitting something else; perhaps you’ve been wanting to stop – insert an undesirable habit/behaviour here – but you just haven’t been able to get started. Why not take some action today and turn Stoptober into an opportunity to make a positive change in your life!